I haven't trimmed the center block yet so it's a bit out of proportion, as is the border. There are two side borders, none top and bottom. This AAQI quilt will finish at 16" x 16" – a nice to hang, don't you think? Notice that Nan has her purse now. I am tempted to tuck a hankie up her sleeve (that's where she always carried her hankie) but I think it would look like a 'mistake' rather than an intentional object. I'll just imagine that her hankie is there. I had intended to use a ribbon or bias strip for the twisty vine in the borders but it just wasn't working out. So I broke the vine into overlapping pieces and that is working well. 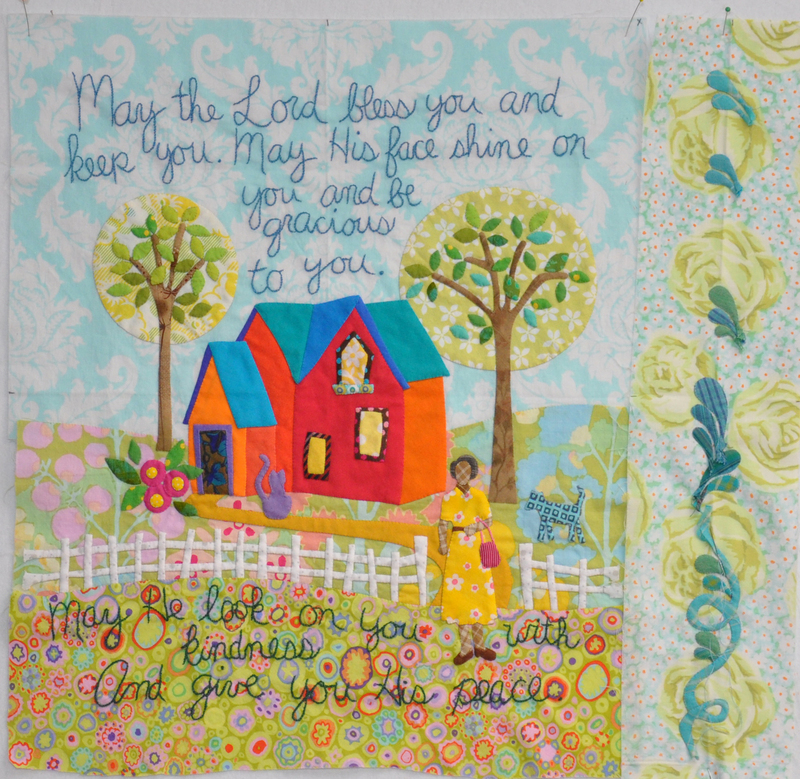 This entry was posted in Notes from a quilter and tagged AAQI, applique, quilt, sewing by Becky Goldsmith. Bookmark the permalink. It is such a learning process to “hear” how your design process comes together Becky. Thanlk you for taking the time to share with us. Becky, your quilt is wonderful. Thanks so much for sharing it with us. I love the border treatment you have created so far. Becky, love the quilt! Please stick the hanky in the sleeve. All of us who remember gramma’s with hankies will know exactly what it is. Okie dokie. Now I just have to figure how to make an appropriately tiny hankie!